In March, most of us eagerly await the sight or sound of our first returning summer migrant. One of our earliest arrivals is in fact a seabird – the Sandwich Tern. They can be seen around our coasts from late March, with the average date of the first BirdTrack sightings on the south coast being 22 March. This is an impressively early arrival, considering that many spend the winter as far away as South Africa, and have further to travel in the spring than most other migrants. Sandwich Terns are larger and bulkier than the Common and Arctic Terns, which are known as the ‘sea swallows’ because of their long graceful tail streamers. They have fewer breeding colonies than the smaller tern species, but they are even more strongly gregarious and nest at higher densities. Sandwich Tern colonies are widely scattered around the British Isles, although one place they no longer breed is at Sandwich in Kent, where their name originates. n addition, in bad years many birds will not breed at all, so the total breeding population, across all colonies, fluctuates markedly between years. 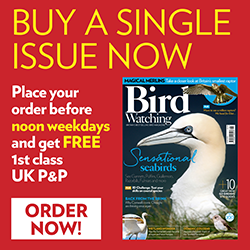 It may seem odd that birds would take a ‘year off’ from breeding, but Sandwich Terns, like many seabirds, are very long-lived; recoveries of ringed birds have shown that this species can live for 30 years. This longevity means they can afford cut their losses, and save their energy for a future breeding season, if conditions are not ideal. The difficult task of monitoring Sandwich Terns is carried out under the JNCC Seabird Monitoring Programme, which collects data on seabird numbers from partner organisations (including the BTO), and from volunteers. The number of pairs breeding in the UK, while fluctuating, has not shown a consistent increase or decline since the 1980s, and is currently estimated at around 12,000 pairs. The population was previously much lower, as in the 19th century people collected eggs from tern colonies for food, before legislation made this illegal and the population recovered. Future threats to breeding Sandwich Terns include predation by a variety of mammals and birds, and human disturbance. This species is also likely to be affected by climate change; warming sea temperatures cause changes in the distribution of their prey species, such as sandeels, and the birds are very vulnerable to rising sea levels, nesting as they do on low-lying ground close to the tideline. Sandwich Terns also face threats outside the UK; their migration takes them around the populated coastal areas of West Africa, where many are caught in fishing nets. The local people are keen to report ringed birds, and many letters arrive addressed to ‘British Museum London’ (the address stamped on BTO bird rings) from Senegal, Ghana, the Ivory Coast and Sierra Leone. According to the BTO’s online ringing report, more British-ringed Sandwich Terns have been recovered in Senegal (782 birds) than in any other foreign country. It’s amazing to think of journeys made by these elegant seabirds, and when I see my first Sandwich Tern of 2011 (and record it on BirdTrack, of course) I’ll take a moment to wonder just how old that bird is – and how far it has travelled.